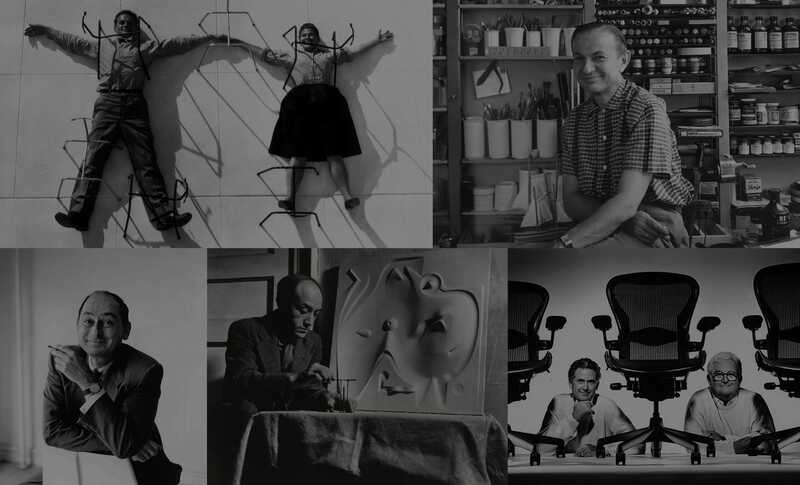 Some of the biggest names in design comprise an all-star cast in Herman Miller’s 100-year history. Girard Tables. Nelson Bubble Lamps. Aeron Chairs. Noguchi Tables. Eames Lounge Chairs. These are some of the best known and best loved designs in the world, and what do they have in common? Herman Miller. The company’s roots go deeper than the modern designs they’ve become so famous for; more than 100 years of history accompany their story. But when a collaboration with Charles and Ray Eames began producing iconic industrial designs mid-century, the Herman Miller name was cemented in design history. Since then, Herman Miller has attracted designers from all over the world, working with some of the biggest names in industrial and product design to produce innovative and iconic pieces that are sought after and heralded by experts, collectors, museums and fanatics alike. So who are the designers who make Herman Miller the powerhouse of modern design it is today? Here we’ll explore some beloved designers and design teams that are quintessentially modern—and totally Herman Miller. 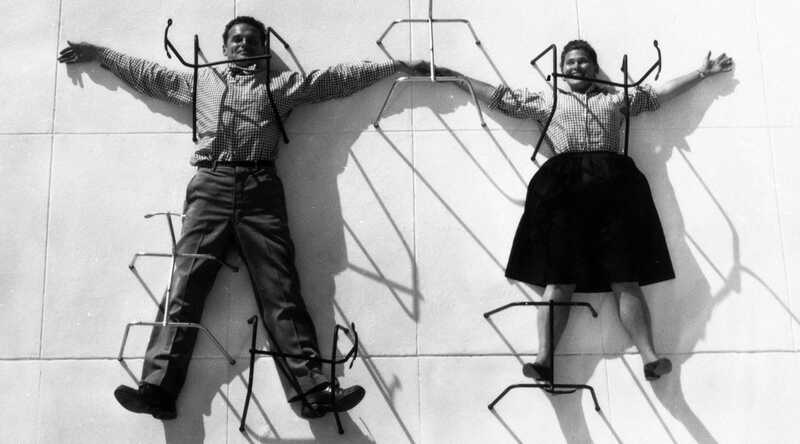 Charles & Ray Eames in 1947 under chair bases. Their joint philosophy was imaginative, process-driven, detail oriented. Their products run the gamut from fine furniture to toys to medical devices. And their joyful creations prove time and again that form and function must exist harmoniously in design to make it truly great. Perhaps their most recognizable design is the Eames Lounge Chair and Ottoman. Inspired both by a classic English club chair and a baseball catcher’s mitt, this design was outside the box for the Eameses’ typically affordable, mass-produced furniture. It is a luxury piece; perennially in fashion, sought after and appreciated. And it’s a work of art in its own right, having a place in the permanent collection at the Museum of Modern Art—right where the Eames story began. Isamu Noguchi circa 1946 with playground model. A landmark artist with international renown, Isamu Noguchi’s career is punctuated by the desire to reconcile duality. The son of a Japanese poet and an American writer, Noguchi grew up in Japan and the United States. His mentor encouraged him to pursue a career in medicine though Noguchi wanted to be an artist; he wound up studying both, though many influential people in his life eventually pointed him back to art. 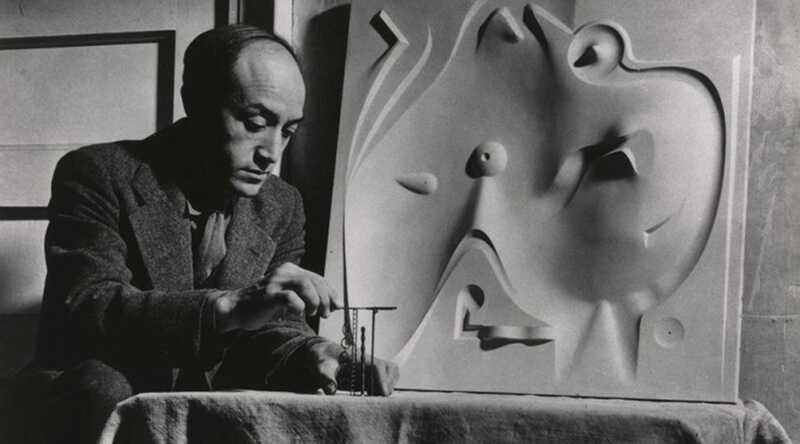 Although told by his first art teacher that he’d never become a sculptor, Noguchi proved him wrong, working in many sculptural mediums as well as painting and designing costumes, gardens, murals and eventually lighting and furniture in surrealist and modernist styles. One of Noguchi’s best known works is his iconic table, produced by Herman Miller in 1947. One look at the Noguchi Table and it’s not difficult to imagine the mind of a sculptor created this balanced, biomorphic design. The table was reintroduced for wide production in 1984 after a brief hiatus during which it became instantly collectible. Still, its availability today has not tarnished its reputation and it remains on display in museums and living rooms the world over. What do the father of American Modernism, the inventor of industrial design and the Herman Miller company’s most famous design director have in common? They’re all George Nelson. It may be arguable that Nelson singlehandedly founded Modernism or industrial design, but his overarching influence on both movements can’t be denied. With degrees in architecture and fine art under his belt, Nelson traversed Europe in the 1930s, meeting with leaders of emerging modernist theories across the continent before returning to America to write about design. 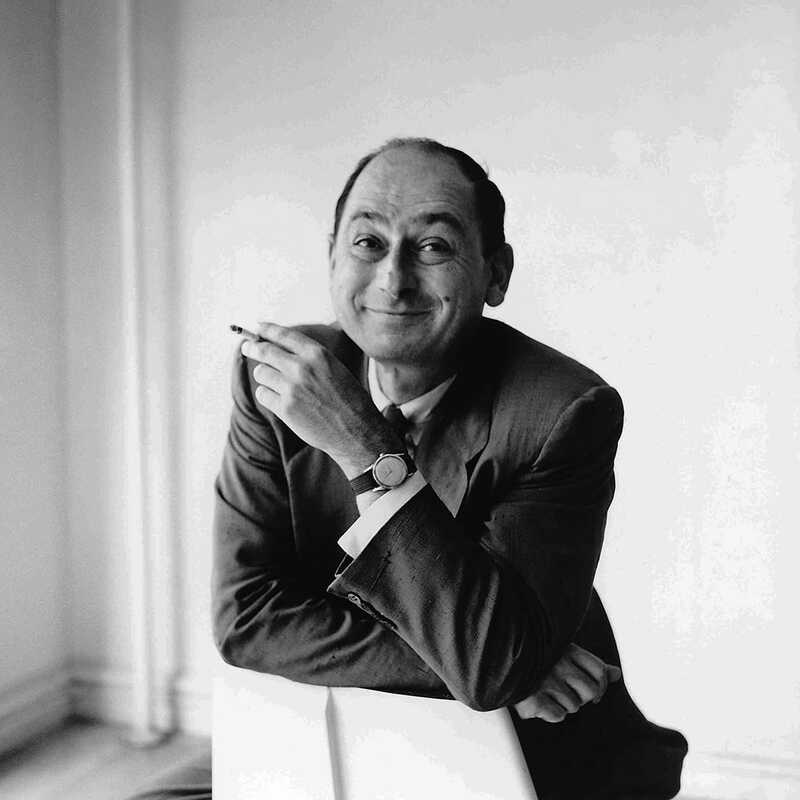 His keystone philosophy was that designers should better the world with their creations, and solving the problems of modern life with design would become the polestar of his career. Nelson’s outlook was such that man could not compete with nature, and shouldn’t try to best it; the most a designer could hope for was a lucky “zap” of sudden inspiration. Still, his innovative thought processes were more than what he attributed to luck; rather, his tenacity and imagination when faced with modern problems was rarely matched and led to some superlative examples of modernist design. Among these exceptional creations is the Bubble Lamp series. To say these designs are iconic is an understatement—they’re some of the best loved lighting designs in the world for the last half century and a fixture in the MoMA’s collection. 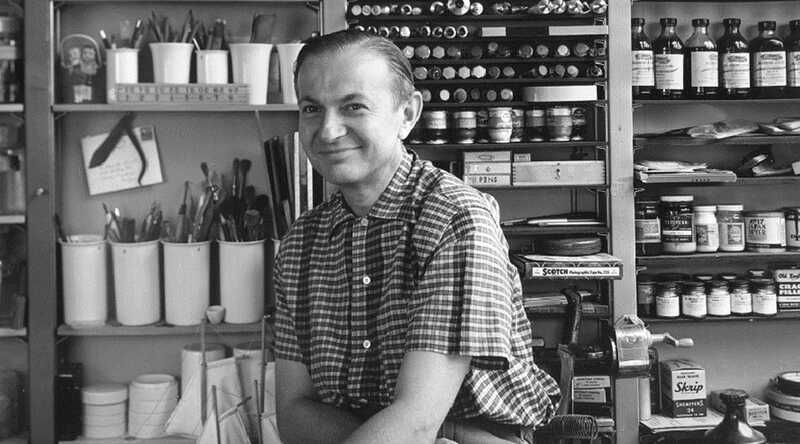 Alexander Girard circa 1950s in his Grosse Pointe studio. Another prominent director of design for Herman Miller was American textile designer Alexander Girard. He headed up the textiles division for the company starting in the 1950s, collaborating with George Nelson and Charles and Ray Eames to form a team that fundamentally defined mid-century design. Girard’s prints and graphics found their way into restaurants, exhibitions, private residences and even an airline. He was greatly inspired by both folk art and a background in architecture, creating intricate patterns and using bright color to inject warmth and beauty into spaces that, at the time, were often drab and utilitarian. Today, Girard’s risks with color and pattern have been well rewarded with myriad awards and accolades. His 100,000+ item portfolio includes furniture, textiles and graphic prints, loving referred to as his “toys.” In addition to creating textiles to complement works by Eames and others, Girard’s own Color Wheel Ottoman is a joyful example of his fine color work with upholstery. Bill Stumpf & Don Chadwick circa 1992. Industrial designers by trade, this duo created what might be the best known modern office chair ever made. Bill Stumpf worked with orthopedic and vascular specialists while pursuing his master’s degree, conducting vast research into ergonomics. Don Chadwick started out in architecture, like so many great industrial designers have, and today he is still producing furniture that wins national awards and international recognition. In 1997, Stumpf and Chadwick set out to create an ergonomic office chair that promoted good health as well as environmental awareness. 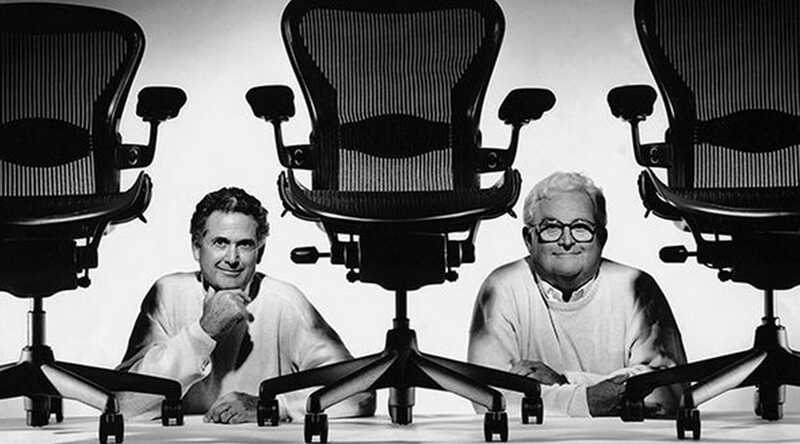 Thanks to their innovation with materials, the duo pioneered a design that changed the modern office chair forever. Without using foam, fabric or leather, they created a completely new kind of chair that was comfortable, adjustable and iconic—it was added to the Museum of Modern Art’s permanent collection before it even went into production. Don Chadwick remastered the design in 2016, keeping all the best of the original Aeron chair while applying decades of research, trial and error to perfect mechanisms and materials that will propel this design for years to come. These designers represent a handful of the brilliant minds behind the Herman Miller catalog. There is more to explore in the designs and products that have defined the brand over the last century—and we look forward to much more to come.